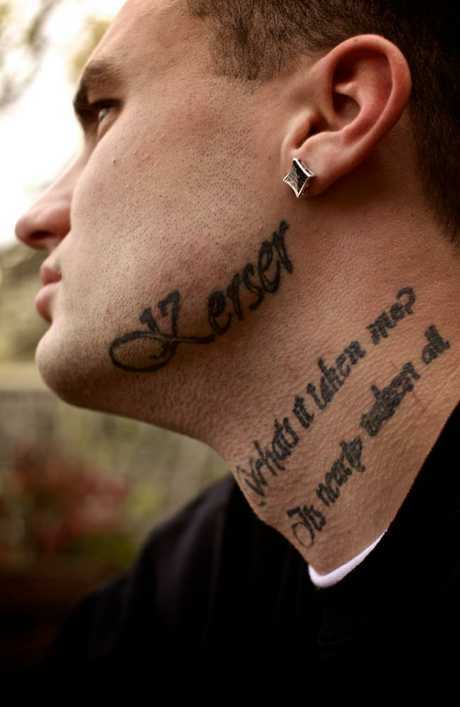 MC Kerser grew up in Cambpelltown, and is one of the most successful kings of gutter rap. 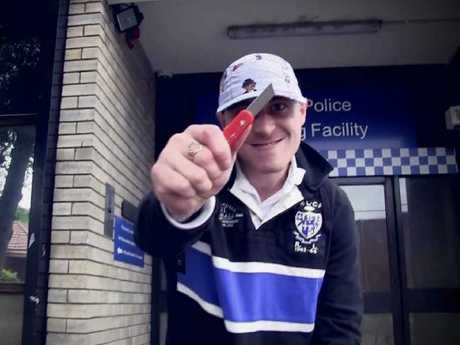 SPORTING face tatts, a gold chain and a Polo cap pulled down hard over his face, Luke Greig - better known as gutter rapper Skeaz "Skeamo" Lauren - cuts a jumpy figure as he makes his way through this inner-city Sydney pub. You can't blame him. Just four weeks out of prison and minutes off a urine drug test at a local courthouse, he's only beginning his transition to life on the outside. "This time it sorta kicked me in the arse. For me not to be go back there, I gotta change my ways, I gotta turn right," he says, adding, "I'm sick of going to jail - I'm sick of six-minute phone calls, I'm sick of one-hour visits, I'm sick of f**ken being told what you can do and can't do, I'm sick of wearing green." At 35, Skeamo has spent two-thirds of his life grappling with drug addiction, criminality and stints in prison. In between, he's also managed to foster the musical genre known as gutter rap, a uniquely raw and Australian version of hip hop born out of the nation's burgeoning public housing ghettos. Labelled by some as try-hard gangster rap and others as a cancer on Australian youth culture, it has garnered hundreds of thousands of followers both online and on the ground, along with tens of millions of plays on YouTube, Spotify and iTunes, all despite zero support from the nation's mainstream radio stations and record labels. Recently the genre welcomed its first fully paid touring artist in MC Kerser, a product of the Campbelltown housing commission in western Sydney. Skeamo's younger brother NTER is another up and coming talent in the genre. But Skeamo baulks at comparisons to gangster rap. "It's not gangster rap. It's the life that we've lived, that I've lived, you know what I mean," he says. "A lot of people can't take me because of the realness I guess - 'this c**t is a piece of sh*t ra-ra-ra'. You're entitled to your opinion, but as you said, I am an elder statesman in this game, I have been doing this a long time, and I'm not rapping about barbecues and f**ken flowers 'everything is sweet' - 'cos life is not sweet, not my life anyway," he says. MC Kerser grew up in housing commission properties around Campbelltown. His music has struck a chord with many young Australians, and he’s recently been successful in touring. Skeamo, who grew up in public housing in Hurstville, in south Sydney, was 13 when his mother was consumed by heroin addiction. "Early life was pretty rough, know what I mean," he says. "Being at a young age, you sorta didn't understand … You're wondering what have I done wrong as a kid? What have we done wrong for her to be doing that? Like, we're meant to be kids. "We're meant to have loving parents there," he says. "Your parents are meant to take you to school, pick you up from school, have your lunches ready, take you out for dinner, know what I mean? That stuff didn't happen so we got thinking, is it us? There's no one there to say it's not your fault," he says. In the absence of adequate role models and family connections, Skeamo gravitated towards the kind of people who could give him purpose. "You'd see (older criminals) in bundles, you know, fresh gear - Polo, Lacoste, fresh shoes, gold chains, Tag watches - and you're very impressionable when you're younger. You don't have the love and support you're meant to have at home, so you go looking for it elsewhere," he says. The pain of his childhood often manifested in anger, violence and criminal activity. The tattoo on his torso, "Sydney Searchers," is a brazen reference to the break-and-enter crew he used to be a part of. "You hate the world, you're dirty on everyone because you're upset and you're angry with what's at home, and you're a kid [so] you don't know how to deal with your anger, you don't know how to cope, you don't know how to fix it. You got someone looking at you wrong, you take it out on someone else," he says. Drugs became a way to "numb" the pain. 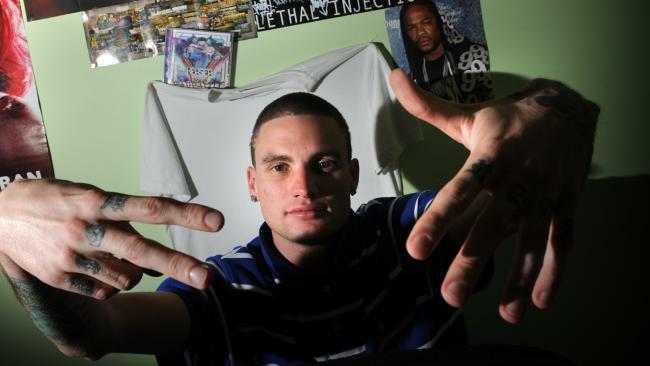 He first tried heroin as a 16-year-old and was smoking ice by his twenties. "It numbs ya. It blocks out everything. Things will f**k up and then you'll have a smoke and everything is fine. You don't give a f**k," he says. Throughout it all, music provided therapy as well as a platform to share his side of the Australian experience - one that is a lot more common than you might think. "There's a lot of kids out there stuck in the same rut - parents are alcoholics or on drugs. It's hard 'cos you're a kid, you don't know what's going on. You want your mother or dad to be there and do what they're supposed to do but it's not happening. You're wondering why - know what I mean - your mother is on the nod, f**ken sleeping at 12 o'clock in the day time. After a while you sort of understand … but it's a very, very, very hard learning curve to deal with, to experience," he says. While derided by many, Dr Liz Allen, a demographer specialising in social trends, inequality and census data collections at the Australian National University, sees significant value in gutter rap, claiming it gives voice to a growing, though little-heard, sector of Australians. "Through song we're seeing insights of what it's like to have grown up in such circumstances and it's therapeutic for the people singing about it - 'This is my life, this is what I've gone through, hear my story so that it is not repeated,'" she says. "Let's not repeat that same mistake, learn our stories, learn our history, we're part of Australian history." Dr Allen, who herself experienced homelessness as a teenager in western Sydney, says mainstream arts and culture do a poor job of representing marginal elements of Australian society. It's an oversight which gutter rap goes part of the way to addressing. Life in public housing can be very difficult, with social isolation common. Residents are sometimes evicted to make way for new private housing. 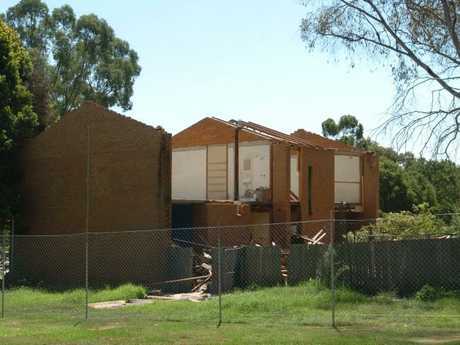 Pictured here, old public housing homes demolished in Minto, southwest Sydney, to make way for new private homes. "I grew up in significant disadvantage and I do not see myself reflected in the media, I don't see myself reflected in the arts, I almost don't see where I fit in in the grand scheme of things and it has a really disempowering feeling," she says. "Am I part of the Australian landscape? I don't feel like I have a shared story anywhere. 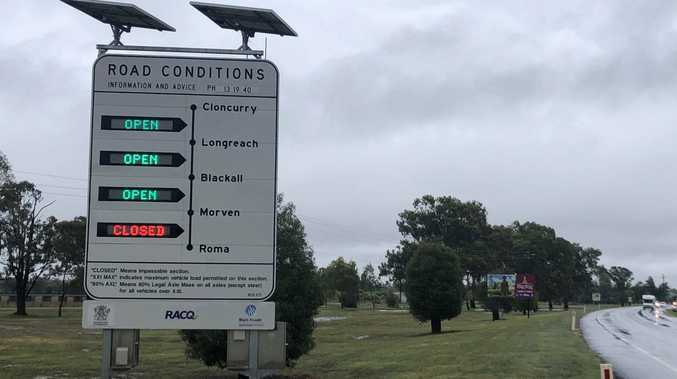 But when I connect with stories of people who have experienced what I have - homelessness and severe disadvantage - I go, 'OK there are others like me out there and I do have a place in the Australian story, and I want my story to be heard,'" she says. Australia might like to think of itself as the land of milk and honey but the statistics tell a different story. Despite one of the greatest periods of prosperity on record, homelessness actually increased by 14 per cent between the 2011 and 2016 census. The most recent study of poverty in Australia found a total of three million people are living in poverty, including 731,000 children - or one in six children under the age of 15. Dr Allen is unequivocal about Australia's failure to look after its battlers, laying the blame particularly on housing and policy, which has led to the segregation of rich and poor and public housing waiting lists stretching up to 20 years long. "Across the board in Australia there is certainly a recognition that past policies have been failures," she says. "Historically in Australia, particularly in Sydney and Melbourne, government created public housing in very concentrated areas. "So there is a move and a recognition now that concentrating public housing in a particular area or zone is perhaps not conducive to a level of social interaction that might see that people will feel there is a way out," she says. She is also critical of plans to sell off public housing located in more prosperous areas of our cities and states in order to build more public housing where the land is cheaper. "Certainly we're seeing a lot of areas where clustered public housing has been sold off but at the same time we see areas for example along the flood-line in the Windsor and South Windsor areas in the outer Sydney area being gobbled up for public housing because it is relatively cheap, and it's out of the way so to speak," she says. 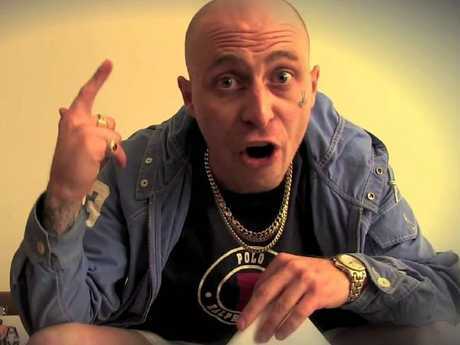 Skeamo hopes gutter rap might make people stop, listen and empathise rather than criticise. "The things I've done doesn't reflect the person I am today," he says. "A lot of us are victims of circumstance. We can't help the cards we've been dealt. The cards we've been dealt we gotta play 'em, know what I mean?" he says. - For more information on gutter rapper Skeaz "Skeamo" Lauren, visit his Facebook page.